Several statewide organizations have been pushing for an amendment for years, including the Vera Institute of Justice. William Snowden, the institute’s director and panel member, said non-unanimous juries help determine if the accused are willing to go to trial. “Trials are seen as justice, but it’s not a fair playing field in Louisiana,” Snowden said. Since 1989, twelve Louisiana prisoners have been exonerated after juries with non-unanimous verdicts. Rather than keeping us safe, the abnormal law chips away trust in the state’s criminal justice system, Snowden said. 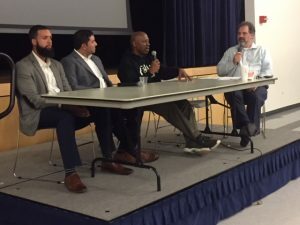 Aaron Ahlquist, Regional Director of the Anti-Defamation League and panel host, said those exonerations are just the impacts of not requiring unanimity. A barrage of local, state, and national organizations from completely different ends of the political, religious, and social spectrum have signed on to support the amendment. Even lawmakers from across the aisle are teaming up; the Louisiana legislature passed the referendum onto voters this May, with support from the GOP. The success stemming from the House’s vote has empowered other groups, Norris said, which has vaulted the issue to the forefront. While support for the amendment is apparent around most of New Orleans, the rest of Louisiana needs to support this issue. Snowden predicts a fifty-fifty chance of the referendum passing, especially with some of the opposing rhetoric stemming from other parishes. At least five parish-level prosecutors have voiced opposition to the amendment, and even more haven’t voiced a stance either way. That’s where voters come in, Snowden said. Some opponents claim the irregular law allows for a more efficient criminal justice system, and prevents serious criminals from avoiding prison time. But for 48 other states, unanimous juries have resulted in fewer prisoners – and fewer exonerations, Snowden said. Early voting ends Saturday. Polls are open from 6 a.m. to 8 p.m. on Tuesday, Nov. 6. Encouraging, informing, and motivating all voters is the only way to ensure the amendment passes, Snowden said; the only way to ensure the storyline from “12 Angry Men” can theoretically occur in Louisiana, Ahlquist added.